Back when people rode horses and families kept milk cows, animal manures were the main source of primary nutrients for garden plants. Times have changed, but many of us still use selected manures produced by vegetarian animals to enrich our soil or fire up our compost. Animal manures come with a heavy bacterial load and thus require special handling, and you must also pay attention to the purity of the source. It is better to be a manure snob than to curse your garden with herbicide residues, growth hormones, heavy metals and other undesirable substances that may be present in some manures. Animals grown using organic methods naturally produce better manure. My small flock of laying hens produces a steady stream of poo, which I can add to my compost or dry for future use. The same safety guidelines for poultry manure apply to other garden-worthy manures, which may come from cows, goats, horses, rabbits, sheep or other grass eaters. Manures from carnivores or pigs should not be considered because they can host pathogens and parasites that can infect humans and can’t be composted away. Spreading or digging in raw manure is an option in the fall, because more than four months (120 days) will pass before the manured soil produces an edible crop. By then the manure will have decomposed and pathogenic Salmonella and E. coli bacteria in the manure will be vanquished by time, exposure and soil-dwelling microbes. In the US, National Organic Standards allow for a shorter, 90-day waiting period for tall crops with edible parts that do not come into contact with the soil, for example sweet corn or staked tomatoes. But digging raw manure into soil comes with a risk. When I tried it with tomatoes, the tomatoes grew into huge plants that produced a delayed crop because of excessive nitrogen from the manure. One of the challenges of using animal manures directly in the garden is guessing at how much to use, which varies with the type of manure and the next crop to be planted. Root crops often react badly to fresh manure of any kind, evidenced by twisted carrots and scabby potatoes. Composting manure before you use it, or simply allowing it to rot, reduces health risks and benefits the garden, too. My neighbour buys a load of cow manure in the autumn, and lets it sit through the winter before digging it into her garden in early spring. Simply ageing a manure pile for three months can kill about 60% of the weed seeds present, and bacterial counts start to drop within days after the manure leaves the animal. Then, when the aged manure is mixed into the soil, soil microorganisms clear out residual bacteria in about a month. Yet the safest approach is to compost manure until it heats up, either by itself or combined with other materials. Bacterial counts plummet at about 100°F (37°C), while temperatures above 122°F (50°C) will kill many weed seeds. 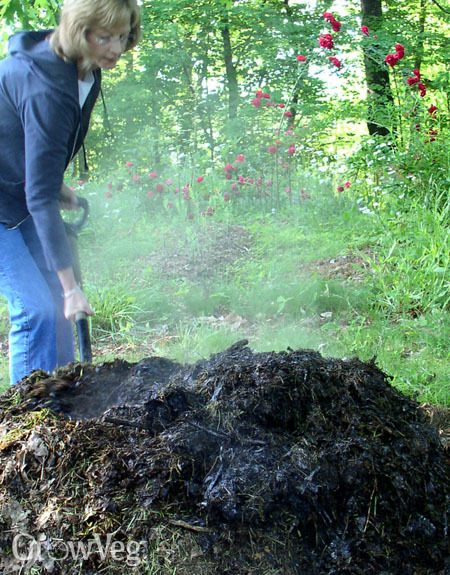 Hot composting animal manures can solve two problems at once. Some manures are weedier than others due to what the animals eat and the efficiency of their digestive systems. However, the soil probably holds far more weed seeds than any manure you might use, so the bigger issue is what types of seeds might be in the manure. This is best judged by looking at the fields where the animals graze. 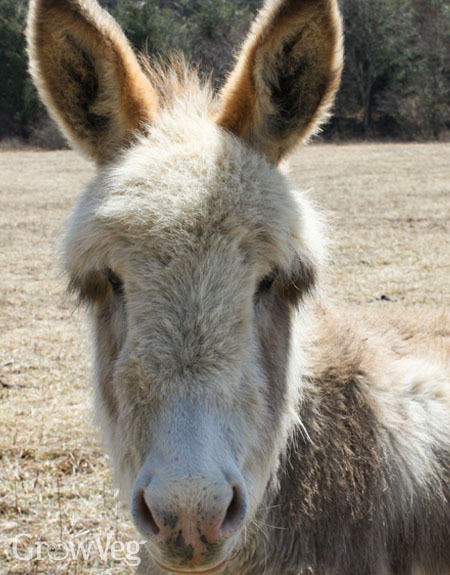 I would happily use manure produced by my friend’s miniature donkey, who grazes on clean pasture, but not cow manure from a farm where the noxious weed called velvetleaf is present. I have enough weeds in my garden without adding more. Should you ever be offered some bunny berries (rabbit manure), take them. Weed-free rabbit manure contains plant nutrients in low doses that won’t overwhelm plant roots. The same is true of the “beans” left in piles by alpacas or llamas, which rot into a material that resembles peat moss. The manure from free-range chickens is nearly weed free, because the weed seeds chickens eat are broken down as they are ground with grit in the birds’ gizzards. This is one of the reasons why poultry manure can be made into a pelleted fertiliser, whether or not it has first been composted. The high temperatures needed to dry poultry pellets also eliminate dangerous bacteria, making poultry pellets safe to handle. Still, it is best to wear gloves. "Our dog eats practically only dried food that contains chicken and lamb products and has never had worms. Can I add his poops to our compost pile? My husband always insists that it must be thrown away." "Marsha, dog poop can contain human pathogens regardless of the animals' diets. You can dispose of it in a separate enclosed composter and use the material for ornamental trees and shrubs, but not for edibles. "